After many grueling years of negotiations with the Department of Defense (D.O.D. ), a settlement was reached in 2009 for the South Farmingdale Water District to begin construction of its Water Treatment Facility at Plant 1. Today, the District is proud to announce the opening of the facility on Langdon Road and that it is officially up and running. Servicing 45,000 consumers throughout the District, the new treatment plant was constructed and put into operation to filter all groundwater containing volatile organic compounds (VOCs) left behind from the Naval Weapons Industrial Reserve Plant in Bethpage, NY decades ago. This new treatment facility will ensure safe, clean water throughout the District, not just for today but for future generations as well. 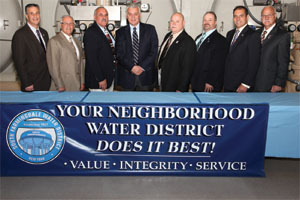 In 2009, the South Farmingdale Water District received a $14.55 million settlement from the D.O.D. to protect the District’s water supply. Due in large part to the help of U.S. Senator Charles E. Schumer (D-NY) communicating with the Department of Justice (D.O.J. ), the District received a check to completely cover all construction and maintenance of the facility, with no additional cost to the customer. In an effort to maintain seamless delivery of high-quality water to its residents and address the impending contamination threat, SFWD began construction of the Plant without a check in hand. A bond issue was approved by the Town of Oyster Bay to cover the costs for construction and maintenance of the treatment system as an interim measure, but the bond was retired soon after.